that cover and choice of of logo head is damm beautiful. "thank you" In person for all your hard work over the years, and for creating these charachter's I like so much. Cool cover Pete...I agree with Tokka on that one. ->> yeh remember, some people were upset about the ' remastering ' ?? I went to that con, and Loved the cover design. My issues hold a special spot in my collection. And if all goes well, I'll be visiting Jetpack on FCBD... I'm fairly certain there's no other comic book shops - Nellie Woe's closed in January - so hopefully you'll have a good turnout. Many fans were upset about the "remastering," as it seemed very unnecessary (much like Lucas's "remastering" of Star Wars, and I'm sure you know how well that was received). I think most fans realize these are your babies and you're free to do what you want with them. But that said, it does feel somewhat like a slap in the face of TMNT fandom, in some silly way. Since you're posting about this, Pete, could you perhaps take a minute and share your thoughts on why you felt the changes were necessary? What was it that bothered you enough to make you go back and alter issues from two decades ago? Because - and I don't mean this offensively at all - they were good enough to turn the TMNT into one of the greatest creations pop culture has ever seen, so if they weren't broke, why "fix" them? Plus, I suspect that no matter how many revisions there are, they will all be rejected and the original versions will forever remain the "definitive" ones. Acceptance is just one of those things that creators have no control over - it's strictly up to the fans, and fandom seldom (if ever) takes kindly on revisionist history (again, case in point: Star Wars). I think your insight on this would be appreciated by everyone (or at the very least, by me). Thanks, Pete! Many fans were upset about the "remastering," as it seemed very unnecessary (much like Lucas's "remastering" of Star Wars, and I'm sure you know how well that was received)." "I think most fans realize these are your babies and you're free to do what you want with them. But that said, it does feel somewhat like a slap in the face of TMNT fandom, in some silly way." "Since you're posting about this, Pete, could you perhaps take a minute and share your thoughts on why you felt the changes were necessary?" "What was it that bothered you enough to make you go back and alter issues from two decades ago?" As I have mentioned previously, I decided to do the "remastering" because I was tired of looking at the old Duo-Shade tones, and, having gotten some Photoshop toning experience with what I was doing on TMNT Volume 4, I realized that I could create a new, fresh look for the old stuff which would allow more of our original ink work to show through (a lot of which got lost due to the way we used the Duo-Shade tones in the originals). "Because - and I don't mean this offensively at all - they were good enough to turn the TMNT into one of the greatest creations pop culture has ever seen, so if they weren't broke, why "fix" them?" "Plus, I suspect that no matter how many revisions there are, they will all be rejected and the original versions will forever remain the "definitive" ones. Acceptance is just one of those things that creators have no control over - it's strictly up to the fans, and fandom seldom (if ever) takes kindly on revisionist history (again, case in point: Star Wars). I think your insight on this would be appreciated by everyone (or at the very least, by me). Thanks, Pete!" 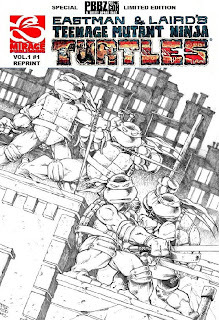 -->> ..as stated above ..
both versions of TMNT #1 are readily available. As of 2006 ..both the Special Editions and the original films were available simultaneously on the commercial level. it is possible to find balance within' all this all around. I really appreciate your taking the time to share your insight. I hope you aren't offended in any way - I ask only out of genuine curiosity, because I think it's fairly common for artists and creators to look upon their own past work and cringe (I do it daily). Through that, there is introduced a (perhaps natural) desire to change and correct past mistakes, an opportunity that some creators take and some don't. It's interesting to me to see which ones choose to go back and try to perfect things, and what makes one decide one way or the other (Incidentally, I think I find this interesting probably because I'm obsessive to a fault, and my personality tells me that I might part of the former category - if I was in your shoes, I don't know if I could resist the urge to go back and update things. At the very least, I'd have a hard time deciding not to). Plus , the process and inner-workings of the mind of other artists always intrigue me. As for my use of the term "many", you are correct - it's all relative. I've seen various pages online dedicated specifically to this topic (I myself learned of your revisions only thru one of these said pages), but the internet community is the most vocal, so perhaps they are indeed but a small minority (though, to be fair, that is also precisely what I mean when I use the word "fan", as the casual reader or TMNT novice probably wouldn't care about - or even notice - those changes, anyway). I think it's a bit silly how seriously we can adhere to the things we loved in our youth to such an extent that we are bothered by even the most minor changes to those things. But nonetheless, I suppose those tendencies are part and parcel of this thing called fandom. I wonder (and again, this is a genuine question) would it bother you if Kirby had gone back in his later years and changed early issues of the original Demon series that were near and dear to you? Anyway, I thank you again for the reply, and for a great discussion (and I eagerly look forward to the FCBD reprint in May)! I really appreciate your taking the time to share your insight. I hope you aren't offended in any way - I ask only out of genuine curiosity, because I think it's fairly common for artists and creators to look upon their own past work and cringe (I do it daily). Through that, there is introduced a (perhaps natural) desire to change and correct past mistakes, an opportunity that some creators take and some don't. It's interesting to me to see which ones choose to go back and try to perfect things, and what makes one decide one way or the other (Incidentally, I think I find this interesting probably because I'm obsessive to a fault, and my personality tells me that I might part of the former category - if I was in your shoes, I don't know if I could resist the urge to go back and update things. At the very least, I'd have a hard time deciding not to). Plus , the process and inner-workings of the mind of other artists always intrigue me." "As for my use of the term "many", you are correct - it's all relative. I've seen various pages online dedicated specifically to this topic (I myself learned of your revisions only thru one of these said pages), but the internet community is the most vocal, so perhaps they are indeed but a small minority (though, to be fair, that is also precisely what I mean when I use the word "fan", as the casual reader or TMNT novice probably wouldn't care about - or even notice - those changes, anyway). I think it's a bit silly how seriously we can adhere to the things we loved in our youth to such an extent that we are bothered by even the most minor changes to those things. But nonetheless, I suppose those tendencies are part and parcel of this thing called fandom. I wonder (and again, this is a genuine question) would it bother you if Kirby had gone back in his later years and changed early issues of the original Demon series that were near and dear to you?" I think this actually gives me a fresh outlook. Thank you. Pete - First of all I want to thank you and Mirage for making available the recent reprint of TMNT#1 via ninjaturtles.com art contest. I was fortunate enough to win a copy of the newer version of TMNT#1 a couple years ago with your signature and turtle head on the cover and was over the moon to be able to have one of comic history's greatest origins stored away in a safe spot to enjoy every once and a while. I had read all the original duotone versions off of the site and now can show my two year old son - when he gets older - what the original turtles was all about. I doubt he will have the pleasure of loving such an awesome story as the Ninja Turles as things like Ben10 seem the standard these days blech. I guess nostalgia is unforgiving. I at first was looking forward to the comic being in the original duotone though now have learnt to love the simple black and white approach of the reprint. I think a lot of artists want to vary their work - even the stuff that first kicked it all off - as to stay dedicated to one universe of characters takes huge determination to not become tired of even the greatest concept. I want to thank you for staying with the Ninja Turtles so Hollywood can't totally kill off the franchise through mediocrity, poor ideas. I know you got their green backs.